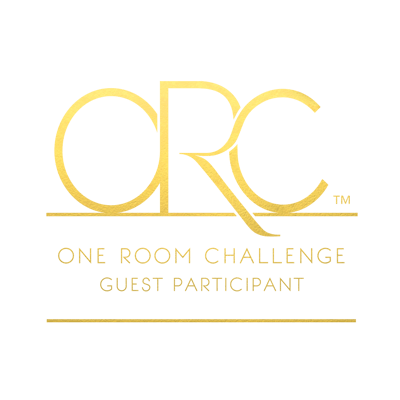 Today is Week 5 of the One Room Challenge and, with the exception of next week’s final reveal, I expect this week will be the most impactful! Certainly it shows the biggest transformation and also it underscores how white painted cabinets simplify a kitchen renovation. 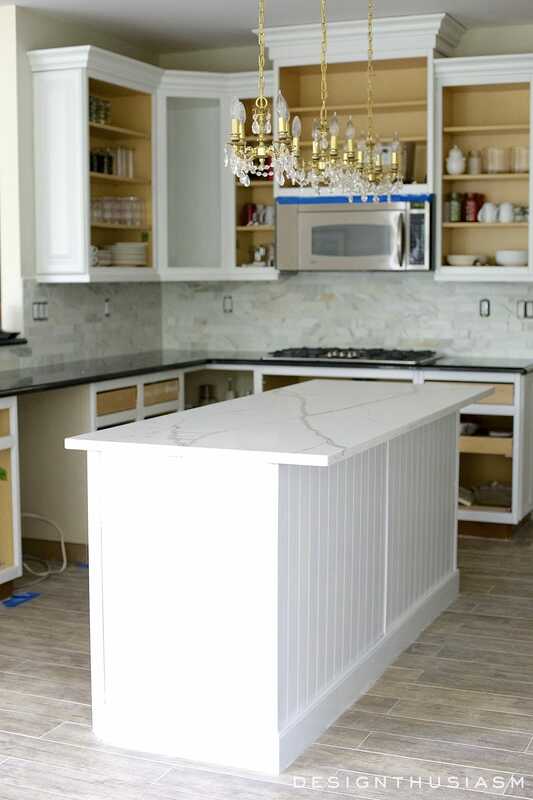 When we left off last week, the floor had been changed to faux wood tile, the island counter changed from black to white and the backsplash became a white marble tile. 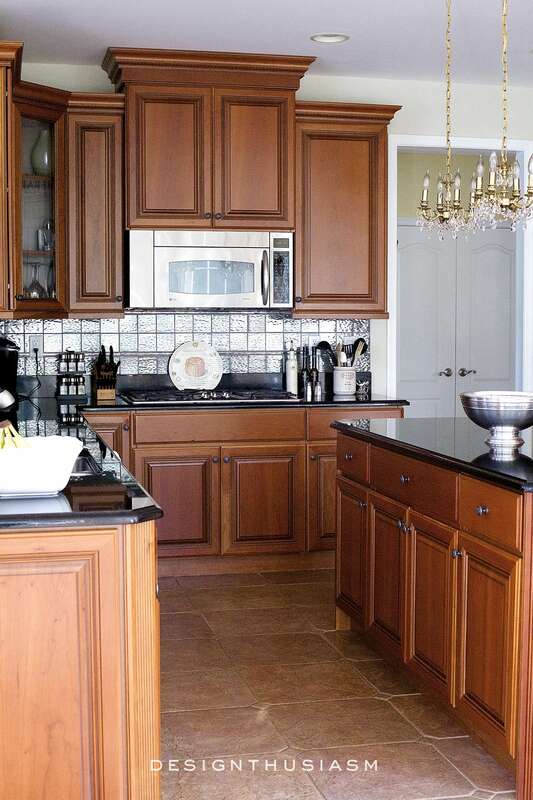 But the cabinets were still a dark cherry wood and so the overall look was still quite dark. With cabinet doors removed, refrigerator in the hallway, dishwasher in the den and dust flying everywhere, we were in a state of utter chaos. But I had a vision and I believed in the plan. This was no time to buckle. The time had finally come to paint the cabinets. 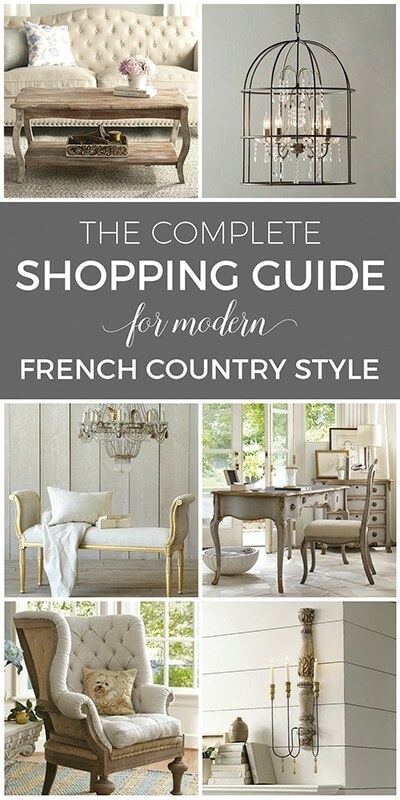 Now, for those of you who would really like to save money, this is certainly a place you can do that by DIY-ing. In this case, I was happy enough that we were not paying for new cabinets so I opted to have the cabinets refinished by a professional. We were also adding glass doors to a full wall of cabinets, and of course changing out all of the hardware, with holes needing to be filled and placing moved. I selected the same contractor who did our butler’s pantry, a complete transformation of a storage closet you can see HERE. The doors and drawer fronts were removed and sprayed in the cabinet maker’s workspace. You may be wondering why there are things in our cabinets while this work was going on. The answer is actually simple. I knew no matter where I moved things to, they’d be covered with dust, so the easiest thing was to keep some things in the cabinets and just put everything in the dishwasher once the job was done. In fact much of what’s in there was moved from other places just to get them out of the way. I found it fascinating to watch this process and how they numbered the doors to ensure they went back in the exact place. 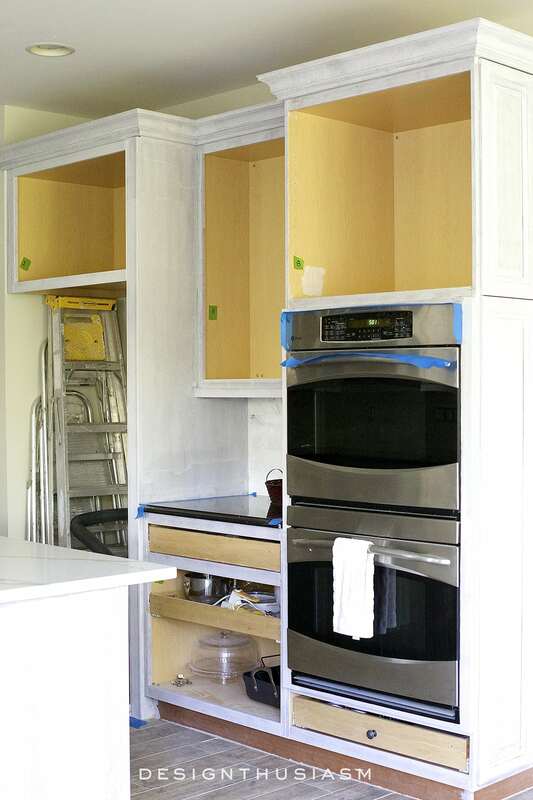 Next they came in and primed the outer cabinets while the doors were being finished offsite with the final coat. 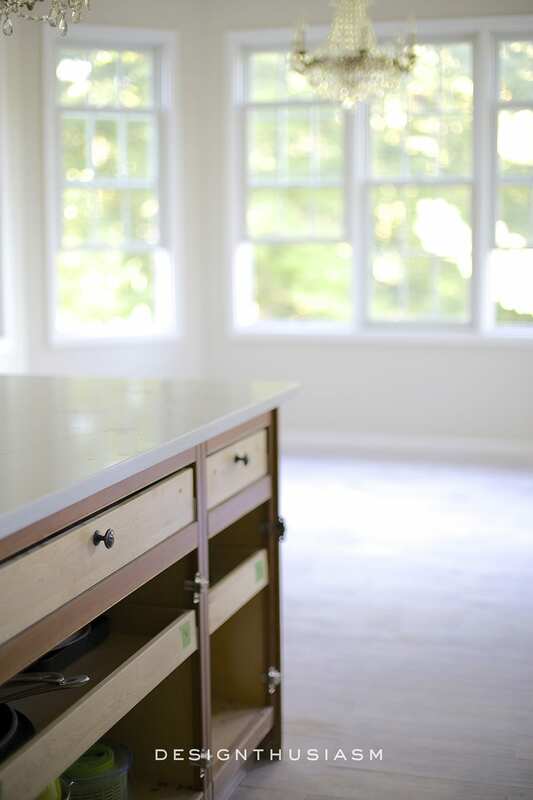 As the painting progressed, the interiors were finished for the cabinets that would have the glass fronts. The paint is Muralo Semi-gloss in Benjamin Moore White Dove. 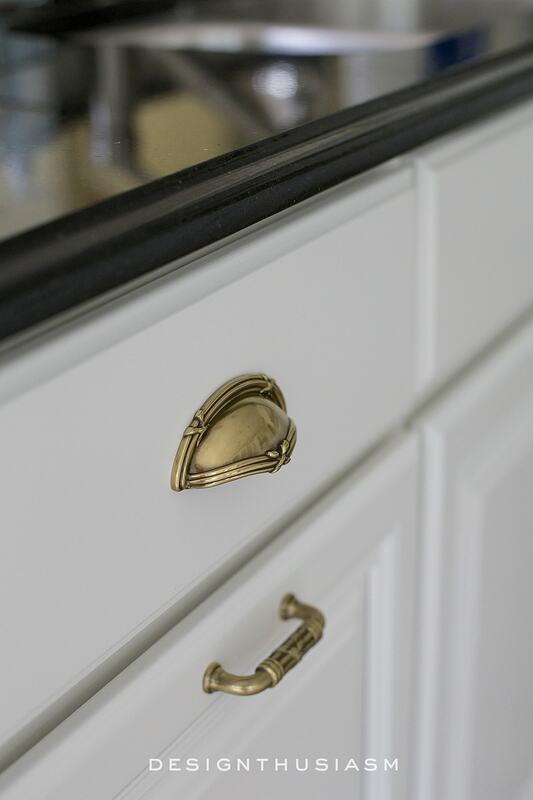 For hardware I chose antiqued brass ribbon and reed pulls, with cup pulls for the drawers. My crystal chandeliers finally make sense. So does the wall color I chose a year ago, knowing all along I’d be going in this direction. In fact, this is the kitchen I always saw when I walked in there. I just needed reality to catch up with my plan. I’m super excited about styling this kitchen! I have cabinets to fill and counters to decorate. I’ve been shopping for antique accessories that will truly make it my own. Stay tuned next week for the final reveal. This is the week I add the personality back in. Apart from the coffee maker, most everything else will be new. Or really… quite old. That’s it until next week, but I invite you to look at the other One Room Challenge guest participants by clicking on the link below. 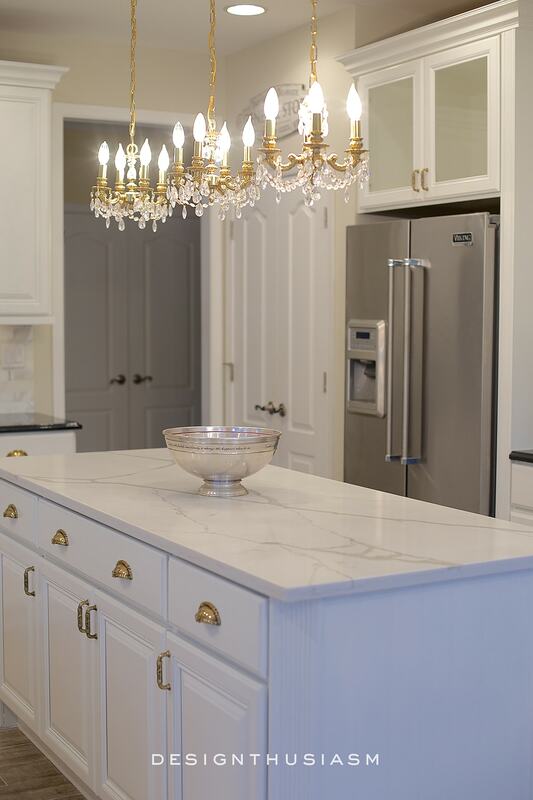 A white kitchen is always a good idea. Excellent transformation! I so agree and thank you!! wow, it is really looking wonderful, so different and so bright! 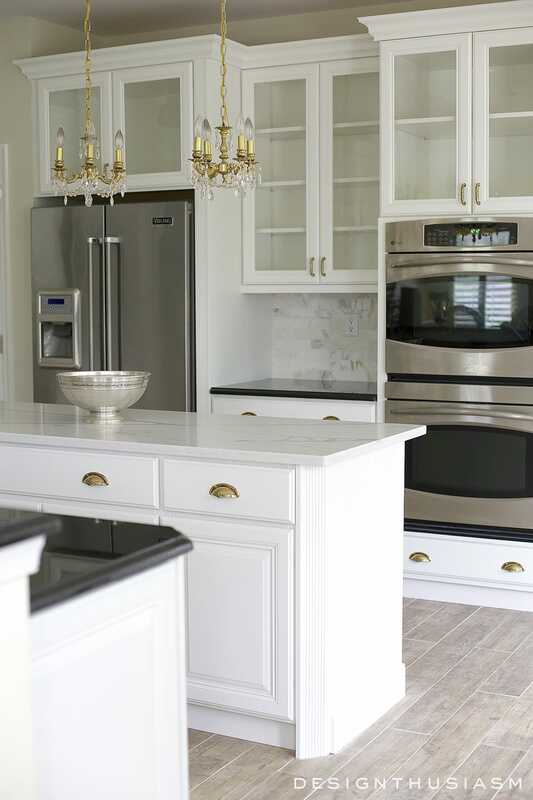 A few years ago, I painted my cabinets and added marble back-splash, but I never thought about changing the black granite that is on the island….but I love yours so much, I think I am going to look into it. Could you tell me the color on your walls? it is perfect with the white/black/grey. 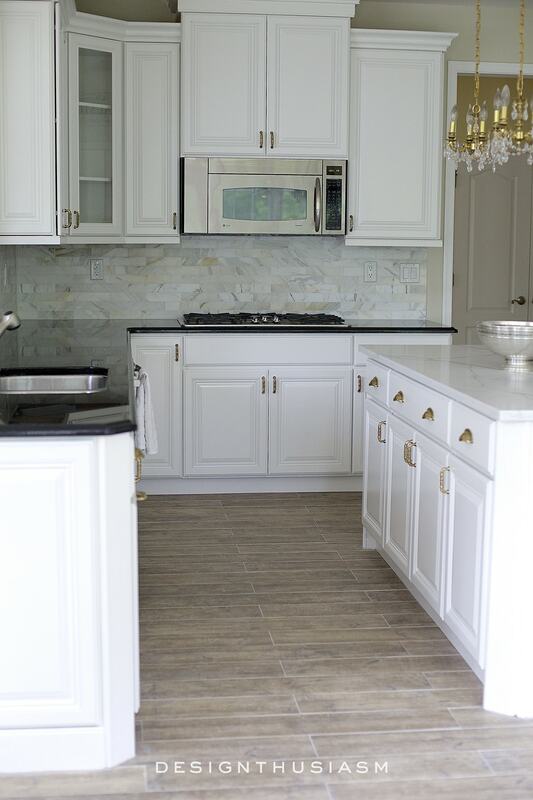 I love the cabinets, but I am partial to white cabinets. Can’t wait for the final revile. What color is your kitchen wall? I like what I am seeing! Looks beautiful and I know how white and lightening up makes you feel since I have just finished the same process. It is incredible how color and light lifts your spirits. I look forward to seeing your new accessories. Thank you so much, Connie!! Absolutely love how your plans are coming together. 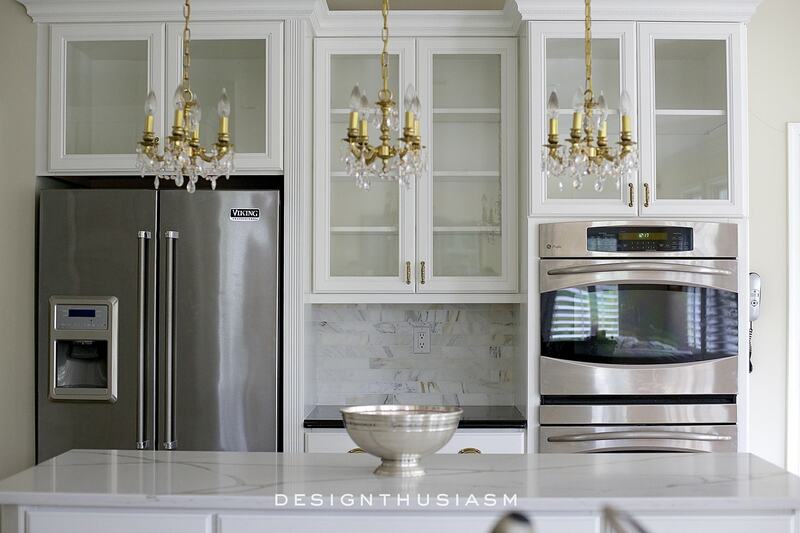 The white cabinets are so fresh and I really like the hardware you chose. However, I have one question: When I see the picture of your appliances the stainless finish seems to look a bit out of place to me. 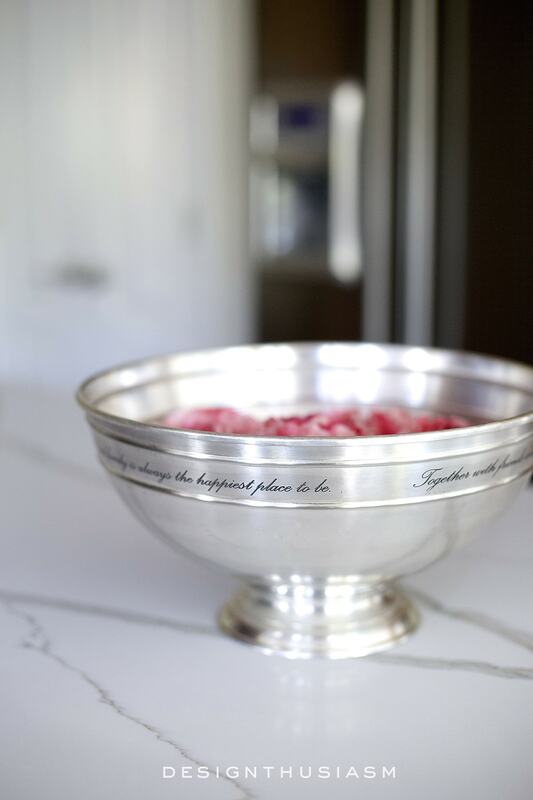 I don’t know if it’s because stainless reads to me as modern and the rest of your kitchen reads as timeless, or if it’s just because I personally don’t care much for that finish. Did you consider white appliances but then decide that the stainless gave a bit of balance or do you simply like the stainless? I know each of us has their own vision so I might be overlooking an obvious decision point. 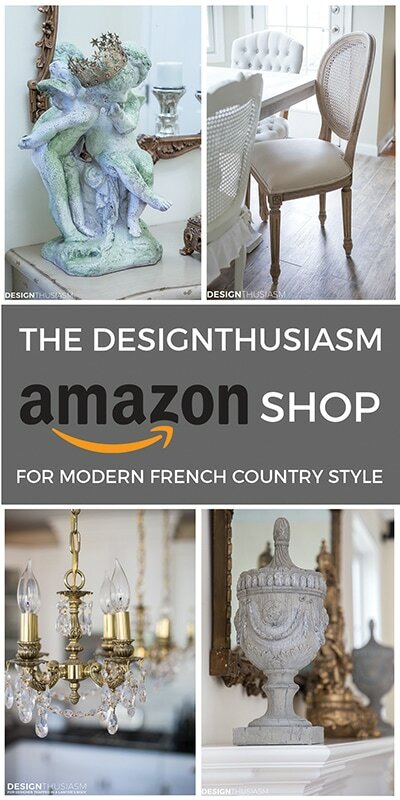 Regardless, I would love to have your kitchen in my home so if you decide it just isn’t quite what you wanted (giggle) please ship it my way. Thanks, Karen, and that’s an interesting question. The quick answer is we didn’t change the appliances (saving thousands of dollars) and that’s what was already there. However, if we did change them, I still would have gone with stainless. I never really see appliances in white now. To me they feel outdated. Generally, it’s either black or silver and I like the bit of sheen the silver provides. Just wait until next week when you see the finishing touches. It may make more sense to you then. I have white cabinets and dark granite counters, I love the look. You have some up great ideas for me to adopt! I haven’t kept up with too many of the ORCs this time around but I always make sure I pop over and check yours out! I cannot wait to see the final result. It already looks incredible! Oh my goodness … Do you just walk in your kitchen and stand there and swoon. It is stunning! Lory I’m so happy that this dream has finally come true for you! Can’t wait to see it all styled up! Oh, Lory! It’s gorgeous! The hardware is exquisite. You’re going to be in your element and loving it for years to come. Everything you’ve chosen is timeless. Can’t wait to see the final touches and your impeccable styling. Thanks so much, Ginger! I was hoping to go for timeless which is why I stayed away from those trendy back splashes but most important is that we’re enjoying it… 🙂 Thanks for cheering me on! I cleared out my email and other chores so I could sit back and take pleasure in your renovation. I was not disappointed. This is beautiful and I will be anxiously waiting for the final reveal! I love your home and all you have done. You truly have a gift for picking colors and pulling everything together. Thank you for sharing it with all of us . LOVE the kitchen. The white cupboards make such a difference. 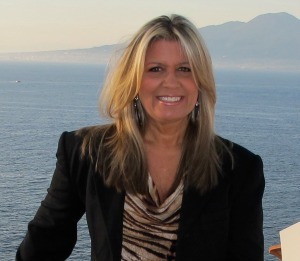 You are a fabulous decorator and I look forward to all your posts…looking forward to the big reveal. Thanks so much for sharing!! Thanks so much, Kathy! It is amazing what a difference paint can make, But I also think the glass fronts are part of what makes it so different. Thanks for sharing in the fun!! Great job Lory! It is all very beautiful. Lory, I love your new kitchen! 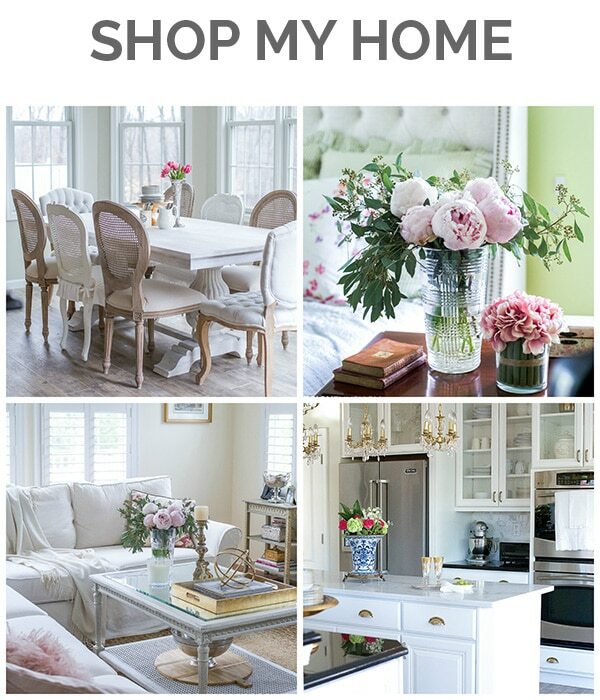 I am trying to get up the nerve to paint my oak cabinets and to add SS appliances. My kitchen is a little dark, and I know both would help. But I worry about nicks and dings on the cabinets that would allow the darker wood stain to show through. Also, I am hesitant to start dealing with the streaking of the SS. Any gems of wisdom for me? Ah, but that’s the beauty of paint, Martha! You can always touch it up… 😉 But also, they told me once the finish sets for two weeks, it should be pretty strong. As for the stainless, I’ve had it since we moved here, so nothing new there. 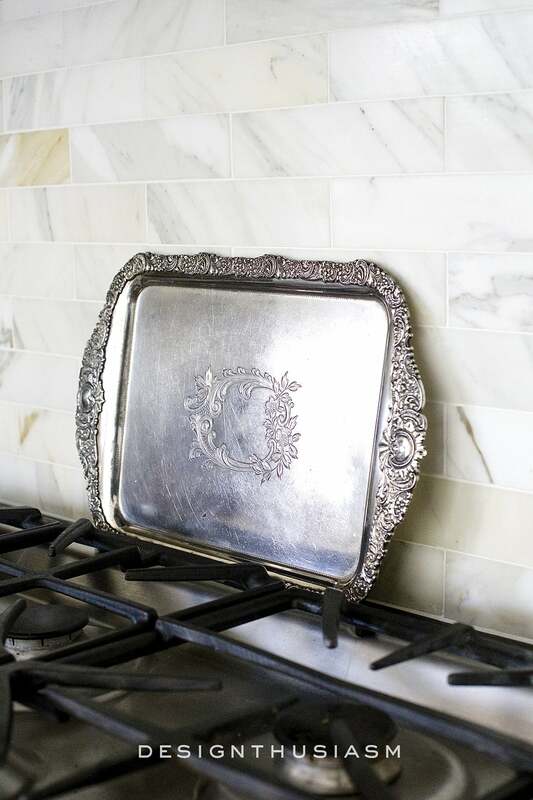 You just get stainless cleaner and you’re good to go! Thanks for the kind words, too!! Gorgeous Lory!…and love the hardware! Lory, this is gorgeous and LOVE those pulls. Our wine room has black cabinets and brass knobs, gold chandeliers, brass cigar stand, champagne bucket and brass/gold accessories. Very masculine with a feminine sprinkling! I too envisioned this long before it was actually built. Can’t wait to see how you decorate this space! Thanks, Gina! Yes, I’m a blingy girl at heart. I love brass and gold and always opt for it when there’s a choice. Interestingly, brass is on trend right now, but it would be my preference even if not. Your wine room sounds wonderful! Lory, your kitchen is absolutely gorgeous. 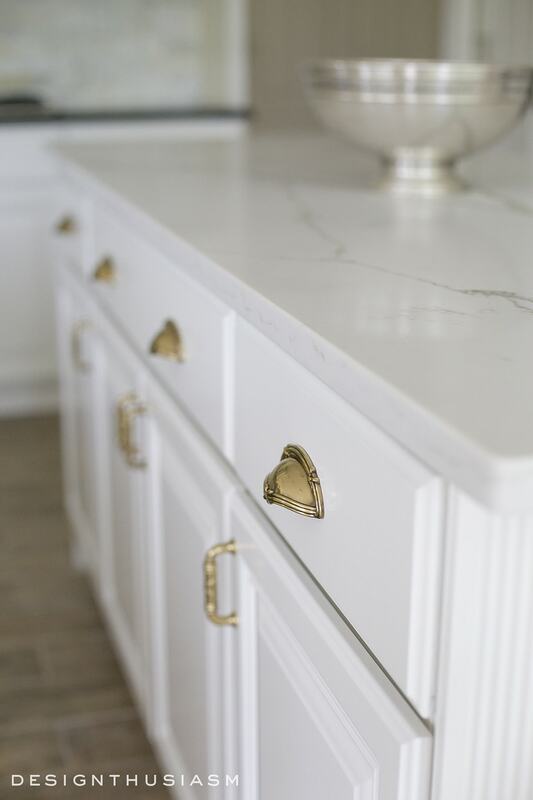 I love the brass hardware and the marble blacksplash. A few years ago I had my cabinets painted by a professional in a light beige. I wished I had gone with the pure white because they are beautiful. It looks like a totally different kitchen. 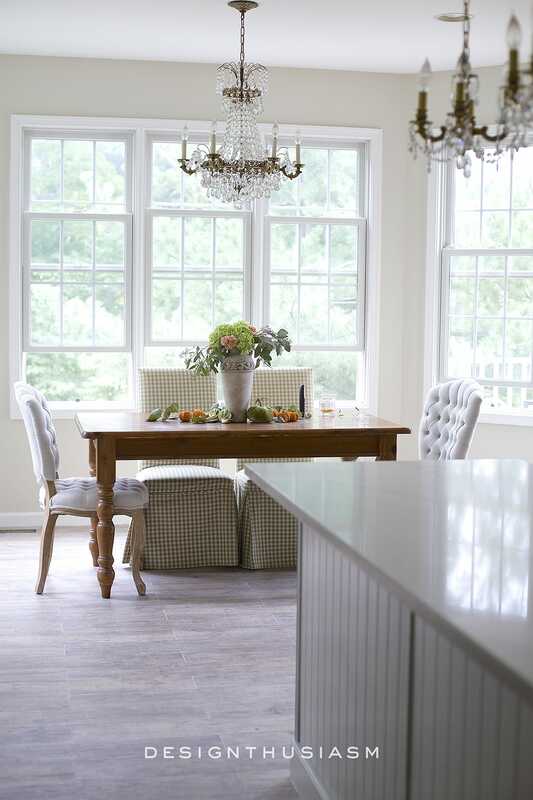 It is wonderful that you were able to have such a beautiful vision of what your kitchen could become. Can’t wait to see the final reveal. IS THIS REALLY THE SAME KITCHEN????? I can’t believe how bright it looks, and gorgeous! I am drooling over the hardware. Would you disclose the manufacturer as I’d love them for our kitchen. Michael has had a change of heart about keeping the cherry look now that he’s seen your new look (didn’t that just work out well LOL!). We’ll have to do ours in a creamy white to match the background color of our granite–too costly to replace granite on a 9ft. 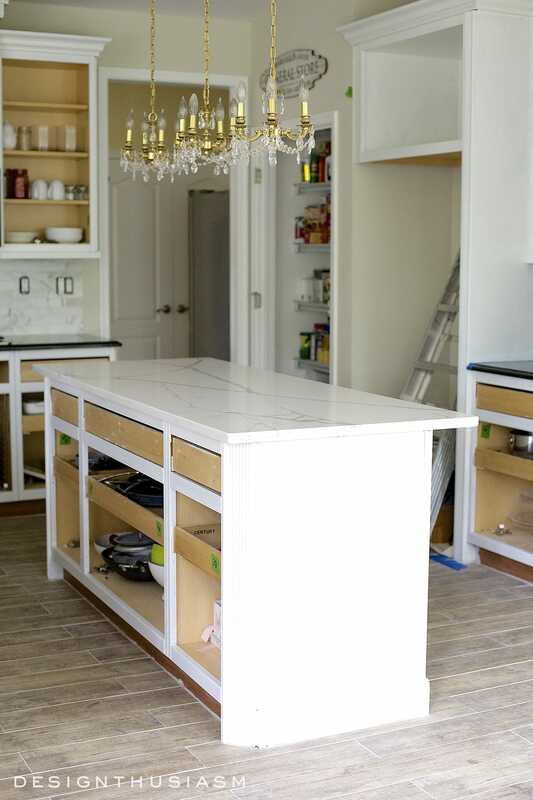 island and the other countertop spaces. Looks great Lory! I’m sitting at the counter right now at our beach place dreaming of the day that I can redo the kitchen and I’m inspired! Thanks, Janet! Imagine the fun we could have if everything was free!! I’m really enjoying the space but I must admit I’m already thinking about the master bath! But that will have to wait at least until next year. Btw, I didn’t realize you were doing the One Room Challenge. 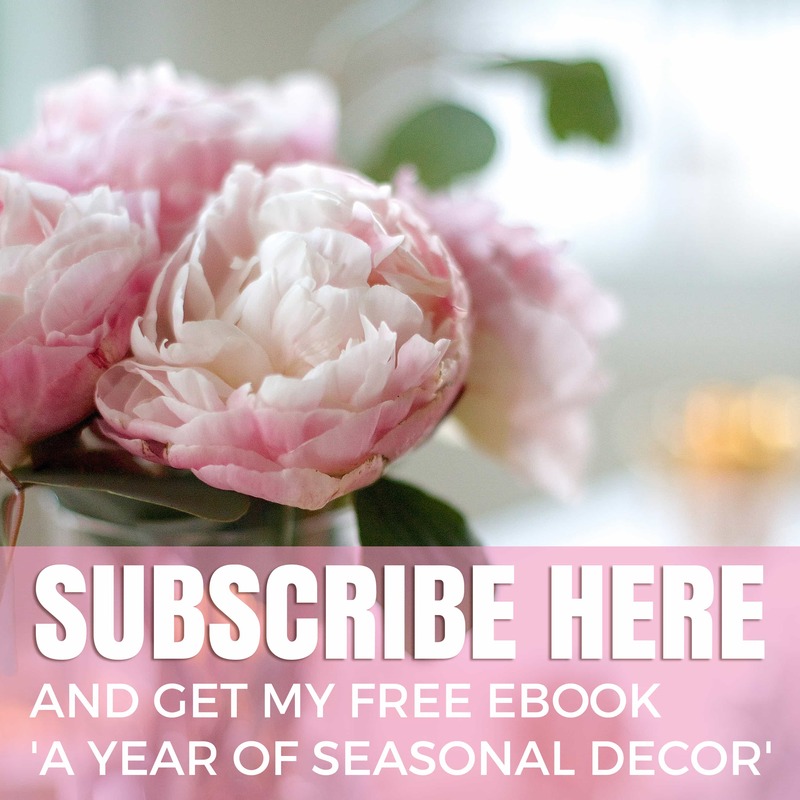 I have a few of your posts in my inbox waiting to read and the feature photo looks beautiful! Gorgeous, gorgeous, gorgeous! I love your kitchen and attention to details! Lory, your kitchen is looking fabulous. We are doing a mini makeover which has already started, but not on site yet. The carpenter has begun some things in his shop and then the mess will begin. All the superlative adjectives have been used, so I’ll just say ditto to all the above. The styling next week will be the icing on the cake of this lovely and thoughtful transformation. Thank you, Merlyn! It’s definitely been a labor of love… 🙂 Thanks for visiting!! gorgeous! i love the backsplash. Lory, stunning everything has come together. The pulls you chose are perfect. I agree, no matter where you put items during a job like this it all gets dusty. Thanks so much, Cindy! Yes, I think the glass made one of the biggest differences. Thanks for visiting! Very nice! I think all the choices are really nice. 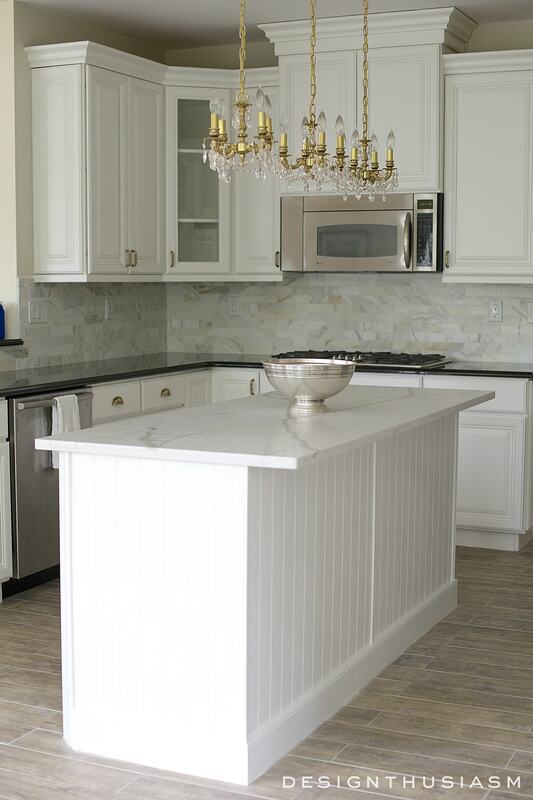 The backsplash adds more personality than just plain white subway tile. I also really love the gold touches. It adds a nice subtle bling. Wow Lory! 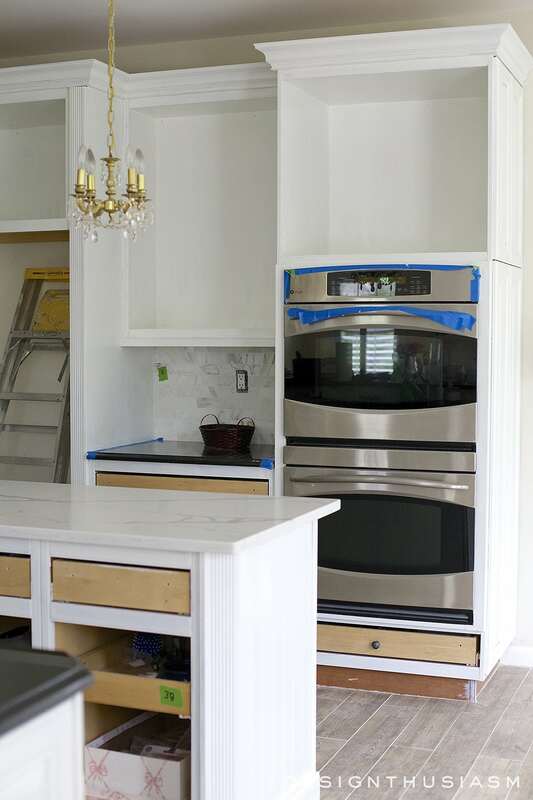 What a difference the painting of the cabinets made in your kitchen. It’s just beautiful! I always wanted to paint my cabinets too but always lost the nerve. Now that I see your beautiful kitchen I really want to give it a try. Would you mind sharing the kind of paint you used and the color? I am guessing that all the cabinets were sanded too? Any tips you can give me is appreciated. Thanks so much!